Mission Critical Fuel Oil is being stored in larger amounts as the emergency demand of these facilities increase. Because this fuel is only used during emergencies and periodic system tests the fuel is used at a very slow rate and therefore it is stored for a very long time. Depending on many factors this fuel will degrade over time, in fact some degradation will start as soon as the fuel leaves the refinery. Water is the big concern for the life expectancy of fuel oil. As part of the manufacturing process some water is entrained in the oil. The fuel is stored in atmospheric tanks, water vapor is then introduced through the vents. Over time this water will start to drop out of the oil and collect at the bottom of the tank. At the interface between the fuel oil and the water microbial life will start to grow. They will feed on the fuel and will actually create more water. These microbes will die and will form sludge that will collect at the bottom of the tank. If this water or sludge were brought into the generator or boiler it will cause problems with the operation. A filtration system is used to remove this water and particulate (sludge). The fuel is pumped from the tank through a set of filters to remove this material and the oil is returned to the same tank. 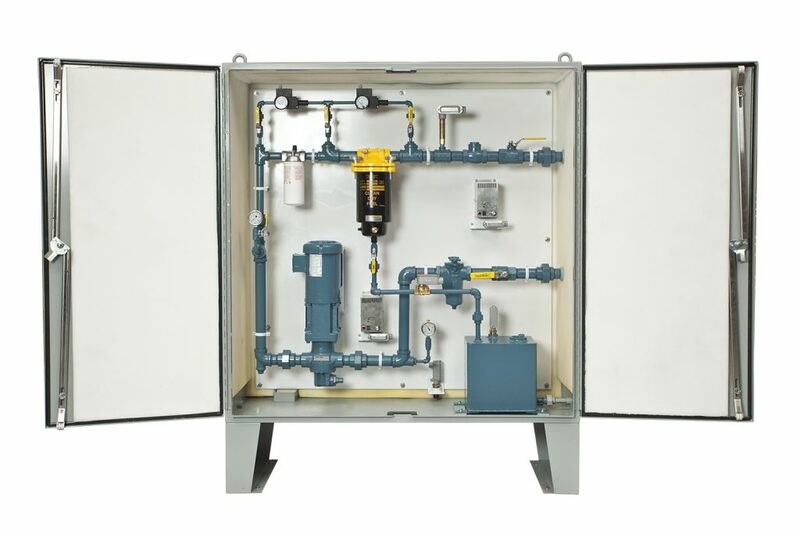 A minimal system includes an inlet strainer, positive displacement pump, and filter to remove water and particulate. These systems can also be very complex with multiple filter sections and other custom equipment. These systems are typically set up to run automatically with monitoring sensors to safely shut down the system if a filter starts to clog. An important feature of filtration systems, in addition to removing water and particulate, is to also allow for the fuel to be treated with additives to kill the microbial growth and to enhance the fuel with cetane boosters and stabilizers. These chemicals are injected into the return fuel flow using a precise metering pump to insure the chemicals are properly mixed throughout the tank. As always it is very important to have your fuel tested. This information will provide you with feedback on how often to run your filtration system and if any additives need to be injected.